Take a journey with everyday people as they share their experiences with breast cancer. Their stories and poetry are heartfelt and invaluable, offering insights into every facet of their travails: diagnosis, treatment, coping, recovery, and loss. These are people who could be your family, who could be your friends. There is a strength which comes with sharing. In reaching out and touching others, we build communities of knowledge and assurance. We let each other know that we are not alone. 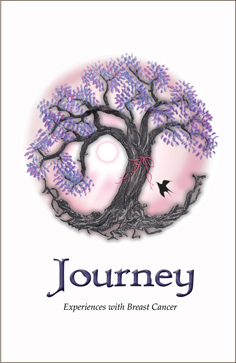 A portion of proceeds from the sale of Journey will go to CounterPart and WHOW. Please choose the correct Paypal option from the dropdown menu, whether you’re ordering from Australia or internationally, as postage will vary.